Find all of the Old Town real estate listings below! This charming community in Near North is home to a blend of luxury row homes, trendy condos, ultraluxury infills, and stunning duplexes. This locale is the perfect harmony of old and new, where remnants of its rich history and new or beautifully refreshed residences come together. 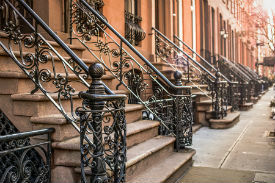 The best part about buying a home in Old Town is that you don't just get to live in a magnificent home, but you'll also be a part of its thriving urban culture. There is such a great selection of Old Town homes for sale and condos. As one of the more historic parts of the city, the streets are lined with beautiful brown and redstone brick facades with a mix of marble on nearly all of the businesses, homes, and condos. The towering row houses and condos are characteristic of Near North communities and are especially prevalent here in Old Town. Since the early days of this community, lot sizes have remained narrow yet long. Architects and developers have actually used this to their advantage to build magnificent, multi-floor buildings that maintain the appeal of downtown Chicago. Even many of the newer buildings have incorporated elements of brick and stone into their design to blend in with the surrounding look of the community. There is no shortage of luxury homes for sale in the Old Town real estate offerings. These homes have everything you'd expect in an upscale home, including designer interiors, high-ceilings and crown molding, private courtyards, games rooms, a remarkable amount of space, and so many different interior styles to choose from. Whether you love the modern look or prefer a more classical elegance, there's something for every discerning taste in the Old Town luxury real estate listings. With a relaxed and matured streetscape paired with the renowned affluence of the area, Old Town condos offer a more relaxed urban presence for those looking to live downtown. 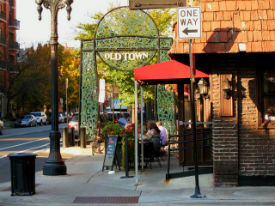 From artistic to affluent, Old Town is a renowned Chicago community for a ranging demographic. With nearly every type of global cuisine just minutes from your door, and a delightful selection of eclectic, locally owned shops and businesses, there's always so much to see and do in this community. Here's a brief sample of just some of the popular nearby amenities. Getting around is made easy by Old Town's great access to nearby major streets, but they're still far enough a way that they won't interrupt your lifestyle. If you'd still like to learn more about Old Town real estate, contact us online or by phone at (312) 893 3560. Let Andreas Holder and his team be your guide to finding the best luxury homes and condos in Chicago.